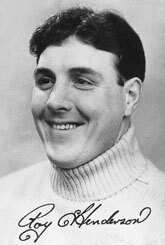 Roy Henderson was goalkeeper at Queen of the South through the club’s best period in the early and mid 1950s. The goallie of enormous talent and dexterity had an astonishing ability to pull off miracle saves to stop what apppeared to be certain goals. Highly confident, Henderson made 381 QoS first team appearances - eighth highest in the club’s history. Henderson was selected six times as Scotland reserve goalkeeper but never given his chance in the starting line up for the national team. Roy Henderson was born in Wishaw and a native of Law. He played for Carluke Amateurs, Lanark United, Third Lanark and guested for Aberdeen during the war. It was at Aberdeen that his talent blossomed when he was playing two games per week, one for Aberdeen and one for his army unit, where he was the sergeant PT instructor. Henderson’s form attracted attention, and with rumours of interest from a prominent English club, Jimmy McKinnell Junior stepped in to sign him. Henderson signed for Queen of the South in July 1946 and from there he went on to have a career as one of the finest goalkeepers of his generation. He was Jimmy McKinnell Junior’s first signing for Queens. “Mad as a hatter,” laughed Black of the outgoing Henderson. “I even seen him out taking a throw in as a goalkeeper. It was in the early days of my time at Queens. He was a law unto himself. I think it was a bit cultivated, I don’t think he was always like that. I’ve seen directors say things to Roy and at other clubs players would be suspended for the retort. He was a mate of mine, we played a lot of golf together.” Indeed Black tells us that in this period in the QoS dressing room, the three principle conspirators for comedy were Henderson, Black himself and right back Dougie Sharpe. Another ex team mate of Henderson’s, Charlie Brown. "Roy was a character, wasn’t he? He was quite a character and he was always full of fun." "The ’Keeper who had Rangers at their wits end"
It was in the 1950 Scottish Cup semi final 1-1 draw against Rangers at Hampden Park that he had one of his finest hours. As one press article said, "The Henderson of the first half was not just another ’keeper having a good day. He was a man living his finest moment". Another reported, "It was not just the shutters that he put up - he practically bricked up his goal against the Rangers forwards". Throughout Henderson’s time on the books as a Queen of the South player they would spend only one season out of the top division of Scottish football. That season was 1950-51 when they were promoted straight back to the top flight as Scottish B Division champions. The success of that season was enhanced by a run to the semi final of the Scottish League Cup. In February 1951 Henderson’s future at Palmerston came into doubt as Queens’ directors considered a bid by Newcastle United. Henderson stayed with the Dumfries club. 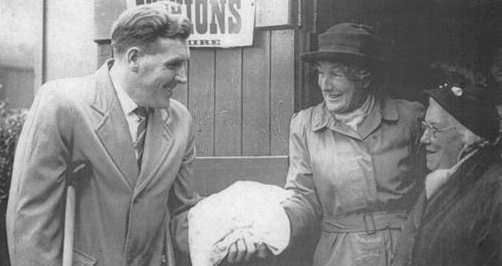 Henderson’s time at the club would mark the most successful period in the club’s history with the top division mid table finishes of the early and mid 50s peaking with a 6th place finish in 1956. Henderson is eighth on Queens all time appearances list with 381 games in league and cup. Queens finest achievements with Henderson in goals are listed in the Queens Legends profile of his team mates, Billy Houliston, Jim Patterson, Jimmy Binning and Dougie Sharpe. The feature on Binning in particular contains further info related to Henderson in the section on the Scotland squad for the 1954 World Cup finals. Many fans across Scotland felt Henderson was the most talented goalkeeper in the land with the press also reporting that he should be given his chance in the national team. It never happened. Many speculated that if he had played for a higher profile club then his international selection would have been a formality. Others suggested that Henderson’s extravert persona, always happy to engage in banter with fans behind his goal (on one occasion an orange was thrown at him to which his response was to nonchalantly peel the citrus fruit and eat it, as well as the throw-in episode mentioned by Bobby Black above), was not to the liking of the international selectors. Henderson was selected six times as reserve keeper for the Scotland national team. Never once in his career was Henderson selected to play ahead of the likes of Jimmy Cowan, Bobby Brown, George Farm nor Tommy Younger. Its also been commented that in his near relentless high spirited zeal for humour, he didn’t do himself any favours with the selectors. Henderson often had little regard for the price of a gag with regard to who it may upset. Charlie Brown: "For all his fun, he could be rather course in many of the things he said. For example I remember he made quite an ungentlemanly remark about Willie Wilson who played in goal." Willie Wilson was a Dumfries boy who was on the books at Queens in the first season of post war senior football, 1946/47. Wilson was a very decent goalkeeper and had he not had to compete with the remarkable goalkeeping talent that was Henderson for the No 1 jersey, he’d very likely have had a good career as the regular Palmerston goalkeeper. Due to Henderson though Wilson for example was only able to rack up 24 league appearances in the four seasons he was on the Palmerston books (1949/50 was his last). Unable to displace Henderson, Wilson left to pursue first team football elsewhere joining Clyde. Wilson showed his worth at Clyde, playing for them Clyde in the 1955 Scottish Cup semi final win against Aberdeen. The broken finger from this game cost him a place in the final that Clyde won against Celtic in a replay. "Willie wasn’t the presence in goals that Roy was, but he was still a good goalkeeper. When the players came off a game once they were talking away and somebody said something about Willie Wilson. Somebody said, ’How long was he at Queens?’ Roy said, ’I was longer in the bath than Willie was at Queens’. Roy was a quality goalkeeper but as I say he was a wee bit... He’d even make course fun of directors. On the pitch though he was a great sportsman, at his job he was really good." "Someone who was always referred to as ’Tattie’ Wattie Johnstone. Wattie Johnstone was on the selection committee of the SFA for the Scotland team. He was also a director at Queen of the South. During the time when Roy played here, Roy used to take people to the end of their lead. He would say, ’I’m not signing, I want more money’, and things to push things as much as he could, and Wattie said this went on year after year after year. It appeared that because of his attitude towards the directors of Queen of the South such as when it came to renew his contract, that was why Roy never played for Scotland. His tongue stopped him playing in goals for Scotland." As a QoS director, Wattie Johnstone may have had another motive to keep Henderson out of the Scotland team. If Henderson had played for Scotland, with his immense self confidence he was hardly likely to have been overawed. Thus for someone of such goalkeeping ability, he would more than likely have impressed. With the accompanying attention from excelling in the international spotlight, the likelihood of vultures circling Palmerston to sign Queens’ star goallie would increase significantly. Thus the Palmerston directors may have seen keeping Henderson out of the Scotland team as a sensible piece of business. Henderson was alleged by many to be the best keeper never to play for Scotland. In one game, with Henderson on stand-by as reserve, Cowan played with a broken finger in fear that Henderson would shine for Scotland and deny Cowan future selection. Bobby Black - "I was there that night, I could hear it. As a winger I was in the other half of the park and I could hear it go. Charlie Dickson of Dunfermline." With the 1956-57 season only four days old, Queens played against Dunfermline Athletic in the League Cup. Henderson rushed from his goal looking to thwart the advancing Charlie Dickson. The players collided. After receiving treatment Dickson was able to continue. Henderson was stretchered off with a broken leg. That moment saw the beginning of the decline of Queen of the South from their top division mid-table status of the previous few seasons. Despite missing most of that season Henderson returned to action briefly but, unable to regain full fitness, he was forced to retire from playing football. He is eighth in the QoS all time appearances list with 381 games. In a poll in the Dumfries and Galloway Standard in 2004 (nearly 50 years after his career ending injury) Henderson was voted the greatest ever Queens player. On 1st January 2013 Henderson was announced as being a 2013 inductee into the Queen of the South Hall of Fame. The late Roy Henderson’s wife, Jean, continued to live in Dumfries as a regular supporter of Queens on match days at Palmerston Park. She rarely missed a game until the last year or so of her life. She was still attending games in the final season of her life before passing away in February 2017.